Just days into the general election, Donald Trump is denying claims of disunity in the Republican Party, following mounting criticism over his comments about a gold-star family and non-endorsements of prominent Republican leaders. 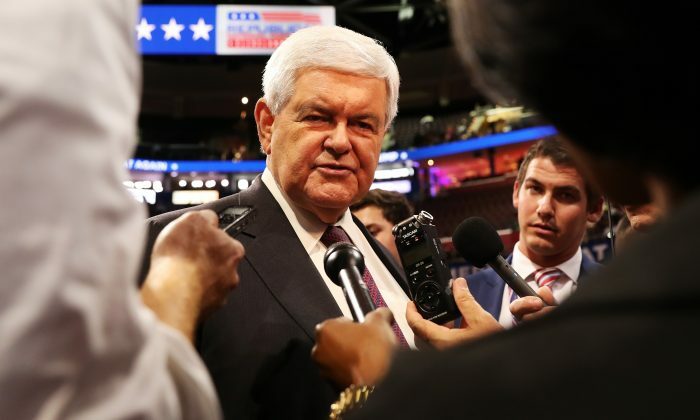 “I think somewhat what Trump has done is just very self-destructive,” former Speaker of the House Newt Gingrich said in an interview with Fox Business. Gingrich, one of Trump’s closest allies and potential vice presidential picks, joined other prominent Republicans in their criticism of Trump following his remarks about the family of a U.S. Army captain killed in Iraq in 2004. Trump had questioned why the deceased captain’s mother, Ghazala Khan, did not speak onstage at the Democratic National Convention in Philadelphia as she stood next to her husband, Khizr Khan. Khizr Khan criticized Trump in his speech, saying the candidate had sacrificed “nothing and no one” for his country and questioning his knowledge of the constitution. Trump put the already tense relations with the Republican leadership further to the test when he told the Washington Post on Tuesday, Aug. 2, that he was “not quite there yet” in endorsing Speaker of the House Paul Ryan (R-Wis.) and Sen. John McCain (R-Ariz.) for re-election in their states. Trump’s comments echo those of Ryan who said in May this year that he was “just not ready” and not “there right now” when asked whether he would endorse the candidate. While Ryan and McCain have endorsed Trump, they have publicly criticized his comments on several occasions. Trump’s reluctance to endorse Ryan or McCain is a twist to traditional political doctrine, which, combined with his unpredictable comments, has made officials in the Republican Party worried. “He has not made the transition to being the potential president of the United States, which is a much tougher league,” said Gingrich. Officials within the Republican establishment had hoped Trump would become a more conventional, “on script” candidate, as Senate majority leader Mitch McConnell put it. However, Trump himself denies that the party is divided. “We’ve never been so united,” Trump said at a rally in Florida on Wednesday, Aug. 3. On Wednesday, several reports suggested that top Republicans were actively looking for an alternative, in case Trump were to drop out of the race. A report by NBC suggested that allies of Trump—including Gingrich, former New York City Mayor Rudy Giuliani, and Republican National Committee Chair Reince Priebus—are planning to talk to Trump about changing the course of his campaign. “The candidate is in control of his campaign,” he said.